Absolutely NO fizzy drinks, energy drinks or fruit juice from now on. Allow them to choose some beautiful iced teas. I have 11 flavours in my pantry right now. 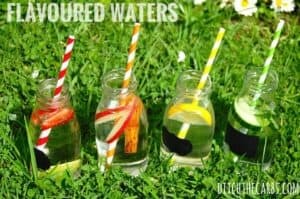 My children love making flavoured waters, it’s fun and colourful. 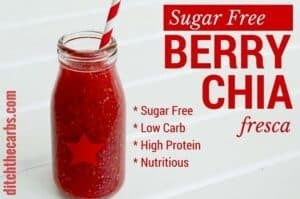 Or a sugar-free berry chia fresca. There are so many better ideas than a soda or a juice. Your slow cooker will become your friendly little helper in the kitchen. There is nothing better than coming home to a meal simmering away at the end of a long day. Many slow cooker meals can be prepared the night before in the slow cooker dish and placed in the fridge. 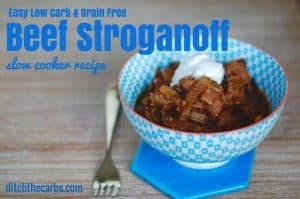 All you have to do is put it in the slow cooker in the morning and turn it on. You can even prepare the vegetables ready to cook fresh when it’s time for dinner. And remember, leftovers are king, so make double and freeze the rest or enjoy over the following days. 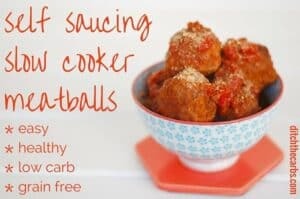 Try my self saucing meatballs or beef stroganoff. These are the most popular slow cooker recipes on the website. I can guarantee, every house will have at least one picky eater. Many parents allow them to eat whatever they can whenever they can. This only makes the problem worse. By allowing them to graze continuously means they will not be hungry before a meal. I think this could be the hardest hurdle to overcome but it is THE most successful tip if you truly want to know how to help your child eat real food. Dinner will always be more appealing if you are actually hungry. Picky children are getting their energy through nutritionally devoid foods such as bread, flavoured yoghurts, muesli bars, crackers and processed snacks. They snack continuously and never finish their dinner – which should be based on simple real food, not pasta, rice or bread. My 8-year-old is the picky eater in our house. At dinner, he knows he is allowed to leave one vegetable on his plate. He doesn’t realise I give him plenty of extra vegetables but ends up eating more this way. He feels he has some control in his meal each night. Americans now spend more on snacks than meals. If those preservatives in packaged snacks are stopping the bacteria from growing in our food, what is it doing to the beneficial bacteria in our bodies? Our gut health is incredibly important with 75% of our serotonin (happy hormone) and our immunity being made in our gut. Sometimes when we are out with our children there may not be real food available, I’m realistic, but let’s see if we can do the best we can as often as we can, then there is less pressure on the occasions when we can’t. Start snacking on vegetables, healthy dips, eggs, tuna, cold meat, antipasto platters, low sugar smoothies, berries, cream, cheese and all the other possibilities. Children love platters, so fill a plate with colourful nibbles. Take a look at all the Snacks Recipes in the recipe finder. Please cut back on deep-fried food when eating out. Much of the oils used are highly processed seed oils such as canola oil or sunflower oil. Seed oils are inflammatory and easily oxidised causing inflammation within our body. Many modern diseases stem from the inflammation within us caused by the food we eat. We really are not treating our children by serving them these fried foods. If you wouldn’t eat them, why feed them to our children? At home use oils such as olive oil, coconut oil, butter, and avocado oil and avoid deep fried food when eating out. If you are new here this page may help you get started, and this page will show you what I keep in my pantry. How To Help Your Child Eat Real Food? Show by example. We make own water kefir and they have this instead of squash/fizzy drinks/juices, they love it. As I’ve gd at the moment I’m keto and monitoring my sugar levels and I’m crazy sensitive to any carbs/sugars so as the kefir doesn’t raise my levels I’m happy it is minimal sugars in it.. and extremely good for gut bacteria and immunity etc etc despite all the sugar in infredients(which the live culture eats away from finished product). Then how to deal with the time cost? Watching with the kids (i.e. the slightly older ones) a few of the food-related movies on Netflix and Amazon TV, like ‘That Sugar Movie’, ‘Love Paleo’, ‘Fat Sick and Nearly Dead’, ‘Forks over Knives’ etc etc etc helps a lot, the kids soon become the food police, not you! And their behavior starts to influence the younger kids as well. Love your advice…any chance your print can be black instead of fine gray? Thx!! Has anyone any recipes for a fussy eater? My ten year old daughter hates all fruit/veg except carrots cauliflower peas and broccoli. Packed lunch is very meat and cheese health you as a result! Any tips?? These are such great ideas, maybe with summer vacation it may be a good time for me to start. I hate giving my children cereal or store bought waffles, but it is so convenient. I am going to work on this. Thanks for the article. All I had to do was tell my son that I had Type 2 diabetes. Being overweight himself, the last thing he wanted was to develop diabetes too (he did not like being overweight either). He lost 100 pounds in one year. It was not easy, but he was determined to it. It took a lot of discipline on his part, and I am so proud of him. He continues to live healthy. He is my role model! We’ve slowly stopped purchasing junk items and making snacks consist of fruits, veggies, and other healthy choices. If it’s not in the house, it’s not an option! I’d love to know how people deal with family members who honestly don’t care about your eating ideals! I’ve been lucky to find LCHF whilst mine are still little – one is 3 (was 2 when we started properly) and the other is 6 and half months. What I’ve found interesting is how long I spent in his younger days trying (and failing) to get him to eat bread and cereals, so transitioning was easy as he was so young. He has a lot of fruit and loves the occasional square of 90% chocolate. Biscuits, cake etc are still treats at Grandparents though as we haven’t convinced then yet!! It’s also been more enjoyable starting solids with my daughter these last few weeks and not having to cook twice! Thank you for creating this site and providing the reassurance that I’m not mad, or wrong for not giving my kids bread, biscuits etc egg and the inspiration for meals – especially lunches! Thank you for this. I needed this confirmation that it’s not crazy to want to feed my almost 2 year old this way. My husband and I already follow LCHF. But I have struggled with what to feed son. We eat extremely low carb right now since we areally actively trying to loose weight. Is there a amount of carbs I should aim for in his diet. I of course wouldn’t want to restrict him to our 20g or less. Oops. Sorry for the typos. On mobile right now. I am not so strict with my children, they are active, fit, healthy and within the normal range. They eat fruit, but only 1 or 2 low sugar fruits a day (they used to gorge on pineapple and mango). I just want them to eat unprocessed lower carb real food and ditch the sugary road, juice and junk, then that is brilliant. My girls said they wish I hadn’t said anything. Just kind of transitioned us over quietly! Strange, eh! With so many good recipes, they’re right! They probably wouldn’t have noticed! Terri I reckon that is a great suggestion. The funny thing with my children is they see me taking photos of dinner before they are allowed to tuck in, and they offer me suggestions all the time (albeit usually a sweet recipe). They have now become supermarket warriors and whisper how much $%^# is in other trolleys. So funny. My 8 yr old said to me a while ago “fast food doesn’t make you fast” – out of the mouths of babes huh! Libby. LOL! “Fast food doesn’t make you fast…” Kids are hilarious! He comes out with some crack ups that boy!